Winter starling above, starling in springtime dress below. 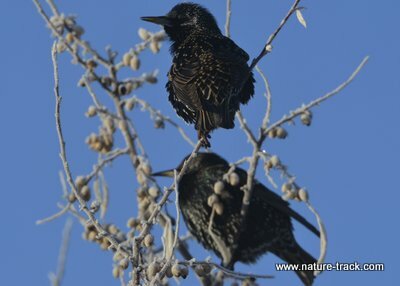 Starlings are handsome birds but that doesn’t excuse their bad behavior. I am at war. I have procured arms and devised strategies to defeat my enemy. So far though, skirmishes have been few and decidedly not in my favor. My enemy is effectively using the tactics of hit and run guerilla warfare. My enemy is the ubiquitous European starling which may be the darling of that continent but is a scourge on this one. 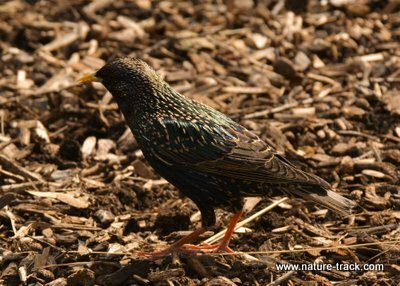 As the name indicates, starlings come from Europe and were intentionally introduced to this country, but didn’t bring their native population constraints with them. The crime that the starlings commit that forces me to adopt drastic and lethal methods is one I mentioned several weeks ago regarding my homemade suet blocks. Starlings discovered them and now 15-20 at a time will invade my yard and make quick work of the suet to the dismay of chickadees, woodpeckers and house finches. At that time, magpies were also a dilemma and reader Bob Cherry sent me his solution to keeping magpies at bay without having to resort to lethal force. You can read about Bob’s magpie solution and see his photos on my blog at: http://www.nature-track.com/nature-blog.html. However, Bob’s elegant solution doesn’t work for the highly intelligent starling, especially given the fact that they are about the same size as the other birds I do want to attract. I have found no other solution other than to declare war with no prisoners. Even while I plot their demise, I have to admit to a grudging respect for the starling. First, they are quite handsome birds. Often described as short-tailed and chunky, this time of year they are almost all black with white spots sprinkled across their bodies. But their springtime wardrobe shines with an iridescent purple-green sheen. Their bill turns bright yellow as well, contrasting against the glossy black feathers. They are handsome birds. I also admire their pluck. About 100 birds were released in New York City in 1890 by homesick European immigrants. 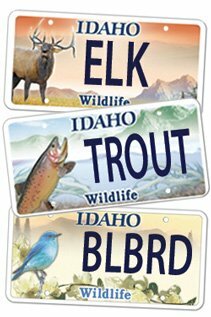 Fifty years later they were in California and now occupy habitat from Alaska, the southern half of Canada and all of the lower 48 states. There’s a lot not to like about starlings as well. These highly adaptable birds not only have taken to our continent and habitat, particularly nesting cavities and nest boxes, meant for native birds, they are also intolerant of other species. They routinely kill nestlings and destroy eggs of other birds and even kill adults that are sitting on eggs. Starlings, as demonstrated on my suet feeder, large flocks can dominate a food source keeping other birds away. They also do significant crop damage, foul livestock forage and generally earn their scientific name of Sturgis vulgaris. 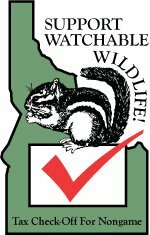 I am a pragmatist, not a wanton backyard wildlife killer. If there were a different way, I would take it. I tolerate house sparrows, another invasive species, so long as they behave. I encourage most other wildlife and most recently can count both white-tailed and black-tailed jackrabbits as newcomers to my suburban backyard along with an ever present cottontail rabbit and even the exotic fox squirrels. Because of their bully nature though, starlings have always been on thin ice and this time they have gone too far. If it’s war they want, it’s war they’ll get. I harbor no illusions of winning though.